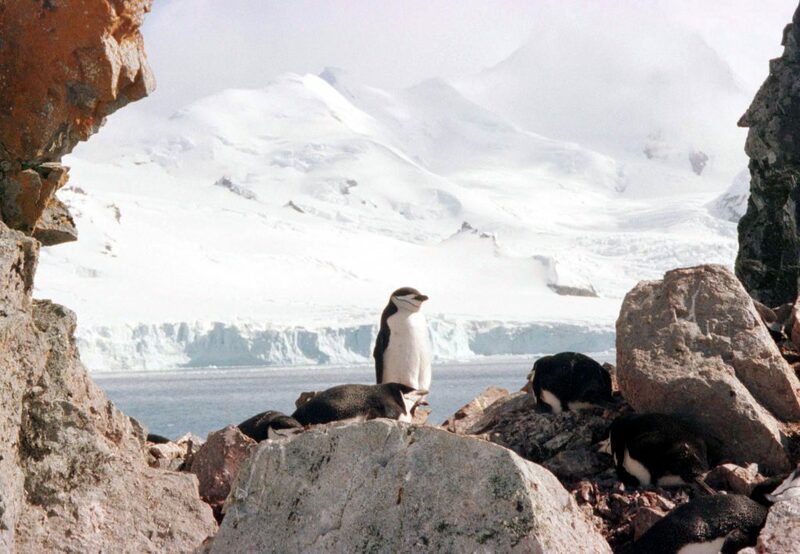 Antarctic penguin populations have dropped more than 25 percent on average over the past two decades, according to a new report released Tuesday from the nonprofit environmental group Oceanites. 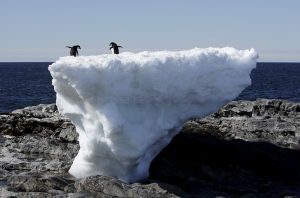 Climate change is leading to a precipitous decline in several penguin populations on the Antarctic Peninsula, according to the group, which completed the first comprehensive survey of the region’s species in 24 years using satellite images. The Antarctic Peninsula — home to 3.2 million breedings pairs spread across five penguin species: the emperor, adélie, gentoo, macaroni, and chinstrap — is one of the fastest warming areas on the planet. Despite a recent but brief cooling period of less than two degrees Fahrenheit since the late 1990s, the Antarctic Peninsula’s average temperature has warmed by five degrees Fahrenheit over the last 60 years, according to the Oceanites report. The winter months have seen a steeper increase — with average temperatures that are nine degrees Fahrenheit warmer than those in the late 1960s. As a result, snow is melting faster on the peninsula, and the area has now experiences rainfall — something that was not seen until 25 years ago. Researchers say those two factors pose a deadly threat to penguin breeding grounds. Three penguin species — the adélie, chinstrap and gentoo — typically breed on dry ground in the summer. If they cannot find dry ground and instead breed on the wet surface, their eggs and chicks can drown or freeze. Some species have been hit particularly hard. Both the adélie penguin population on Petermann Island and the chinstrap colony at Baily Head on Deception Island declined by more than 50 percent. Warming in the Antarctic Peninsula is also causing sea ice to melt rapidly and form more slowly, threatening the penguins’ food source. Penguins feed off krill, and krill feed off the algae that grow under sea ice. Less ice means less algae for krill larvae to feed on. Researchers argue the lack of krill is mostly responsible for the declining adelie populations, which rely heavily on the small crustaceans and less on fish relative to other penguin species. Gentoo penguin populations, in contrast, are actually increasing because they have switched from eating krill to fish. But even penguins that primarily eat fish may not be spared in the long run. Dyan deNapoli, a penguin expert who was not involved in the study, said the warming temperatures are also harming fish populations. “One of the things that happens with rising ocean temperatures, is that the cold water currents — that the fish and krill are in — get pushed deeper and further away from the penguins’ breeding and foraging grounds; making it difficult for them to find enough food to eat,” deNapoli, who has worked for penguins with 15 years, said. Penguins are also threatened when large ice shelves, which the penguins cross to reach their breeding grounds, collapse because of higher temperatures. “As they are trying to walk across, they have to climb over sea ice and could get trapped and die because the ice shelf is not smooth,” deNapoli said. She said predicted sea level rise could also wipe out penguins’ breeding grounds, forcing them to travel further inland. The report does contain some good news. A handful of penguin colonies live in areas largely untouched by the rising temperatures and are faring better than their counterparts. The adélie penguin populations in East Antarctica and the Ross Sea, for example, are growing. Scientists believe ocean and wind currents have largely shielded those regions from the warming trend. Still, Naveen warned penguins are a harbinger of the struggles humans will face in adapting to climate change. “What happens to penguins, happens to us all. We’re all biological creatures,” Naveen said, adding that humans, like penguins, have four basic needs for survival: food, home, health and offspring.